This blog is a jump that I've been waiting to take. Over the past few months I've been reading about how to start a blog, what to write about, and where to start the journey. So, here I am - jumping in with both feet. Let's become acquainted! I'm in my 30's, living on an island in the Atlantic Ocean. I love the rocky beaches, the stunning sunsets, and exploring hidden parts of this land that I call home. Want to know where a waterfall is - I've got directions! 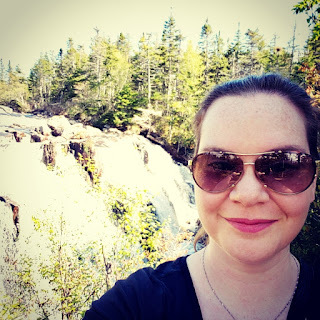 (I've seen more than I've fallen into - I swear :P) Want to hike or see the small towns/communities within a days drive to and from St. John's - I've got you covered! Local eats? OMFG - yes! These are some of the posts that you can expect in this blog - my adventures, love for coffee, horror/mystery pop culture, and the consumption of all that I enjoy (not just food, but also novels, DIY projects, podcasts, etc.). It will be a happy little tornado of everything "Jen". I'll start off trying to post once a week, and we'll see where that takes us. Feel free to leave comments and suggestions on what you want to see - I'd love to hear from you! To contact through email: butfirstcoffeewithjen@gmail.com.